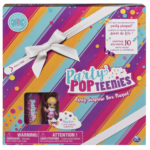 Walmart has Party Popteenies Rainbow Unicorn Party Surprise Box Playset with Confetti, Exclusive Collectible Mini Doll and Accessories, for Ages 4 and Up for $4.98 (Was:$14.97)! Discover the fabulous world of Party Popteenies inside the Party Surprise Box! Wrapped like a gift, this playset has a small window into whats hidden inside: Rainbow Unicorn Ava standsv beside her mini confetti popper, waiting to party! Unwrap your Party Surprise Box and pull open the outer flaps to reveal two bright packages. Within one package youll find cute gifts, and an adorable tiny pet, while the other package holds supercute furniture and a delightful cake!